If you look out for reliable broadband, great value for you money and excellent customer support, Plusnet just comes on top in the list of UK broadband providers. The Sheffield based ISP has received many customer satisfaction awards from ISPA and Which? for its out-standing service. Plusnet retails its own ADSL 2+ (10Mbps average speed) and fibre broadband (36Mb/66Mb average speeds) to its customers, although the company belongs to BT Group. Plusnet broadband pricing is unbelievably cheaper in low-cost areas which cover 80% of homes in the UK. Its unlimited broadband plans which offer standard & fibre options come with price starting from £18.99 per month including line rental. New customers often get free broadband or 12 or 18 months discounts to make great savings in the first contract. 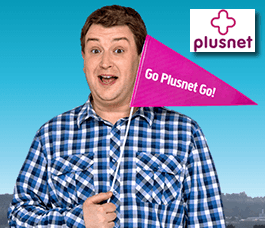 All Plusnet broadband plans offer truly unlimited usage allowance means you can download as much data as you wish. There is also no traffic shaping by the provider even at peak times to ensure that you can get faster speeds for all your internet activities. When you add Plusnet homephone which requires line rental that will cost extra which is added to the total cost and also enables you to get free connection. Plusnet also offers 1 month contract along with 12 month & 18 month contracts. Students and those who need fixed broadband for temporary use can go for plusnet broadband. However, free wireless router is included only when you take its service for 12 months duration. All plusnet broadband plans are prioritized for VoIP traffic while its unlimited plan is optimized for additional applications like downloads, gaming and VPN. Plusnet offers superfast fibre optic broadband packages which come with 36Mbps/66Mbps average download speeds, unlimited monthly usage allowance and free wireless router, however, 12 or 18 month contract applies. Plusnet Fibre Unlimited (36Mbps speed/unlimited downloads) is priced at just £23.99 a month. Plusnet Unlimited Fibre Extra (66Mbps speed/unlimited monthly data) will cost from £29.99 a month. Line rental cost is included. You can add calls for an extra fee. Can`t even fix a fault with their own equipment. i have had to take many days off work, and still the fault with their equpment is not fixed. they continue to take money for a service they are not providing, and as i have lost so much money sitting at home waiting for an engineer to visit if they actually turn up, they claim they have a photograph of my front door to prove they visited, this is contrary to 6 hrs of cctv footage. i may be forced to take them to court, as apparently a payment for a service that they can`t provide is non refundable. After the 3rd and final BT visit my connection speed is less than when i started to complain about it dropping out. and plusnet`s response is its fixed. i think not. Now they are blaming my cctv, they made my internet worse. and now blaming unrelated equipment. i have filed a case with the county court.